"At least he's not shooting them." 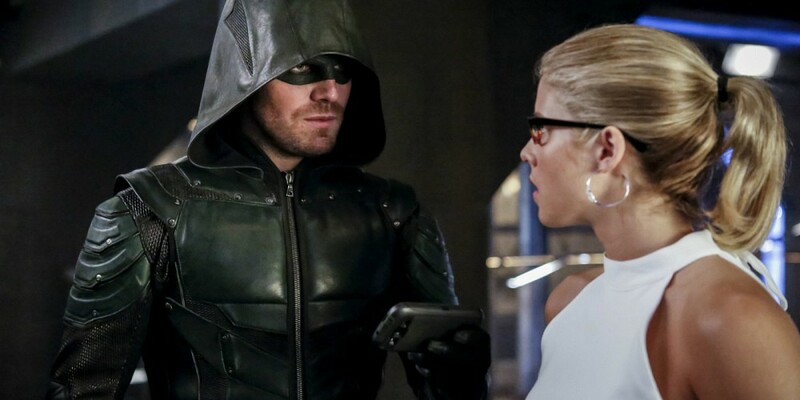 So is the difference between superheroes and vigilantes that Felicity alluded to last week the reason why Oliver treats his recruits like gangster initiates? That's at the core of this episode, as Oliver learns a lesson about being a leader. Oliver's methods have always been brutal, harsh, and lacking a level of trust in teamwork. John gained his trust by standing by him, Thea earned his trust by fighting her demons, Felicity earned his trust by being indispensable. It happened over time, and it allowed the team to work. Once they almost all left the team, Oliver found his trust broken. This was the episode that started to patch back up his torn emotions of betrayal. Except, it wasn't betrayal. Each member of his team had a reason to move on. Like Thea, who couldn't be a vigilante anymore and has found a new role as basically the Mayor of Star City. She is running things while Oliver is being the Green Arrow, and she still plays a huge role in supporting Oliver on his quest to save the city. She might not be in red leather, but in a lot of ways she is still a hero. Like how she uncovered the truth about Janet Carroll and her deal with Tobias Church. John Diggle, on the other hand, couldn't work with the team anymore because he couldn't get past what happened to his brother. So he surrounded himself with a different kind of brotherhood. He thrived in his new role as mentor and soldier, and would've stayed there if things hadn't gone sideways. When a mission goes wrong, John discovers that a corrupt officer has turned criminal. This ends badly with John in chains headed for a court-martial. I wonder how long it'll take for him to turn to Oliver for help. Then there is the Ragman, who started off the episode looking like a villain. His strange powers ended up being tied to a very tragic back story, and the young man under the hood is clearly going to be an important ally for Oliver. Ryan Regan is a kindred spirit, and made the right choice when given the opportunity. He could've focused on his revenge, but instead he saved Oliver from Tobias showing how much of a hero he could be. It was a turning point for Oliver, learning that trust has to flow both ways. So after an episode where he brutalizes his new recruits, including Curtis, he finally takes the risk and trusts them with his identity. It goes to show that Oliver's methods are flawed, and he needs to change back to that person who inspires hope again. Laurel's death affected him in the wrong ways, and it is encouraging that he is already beginning to show he is letting the real lesson of her death sink in. Oliver's initiation into the Bratva continues, this week paralleling the action in the present with the recruits. Facing failure again and again, he finally figures out the trial and gets past it -- only to learn the real lesson, that in the Bratva the only person he can truly trust is himself. While it's a good thing to learn when entering a business where betrayal happens on a fairly regular basis, it was the wrong first test for his recruits in the present. Thea naming Quentin as the new Deputy Mayor works on both a personal and professional level. The grieving Quentin desperately needs someone to give him a hand back up. 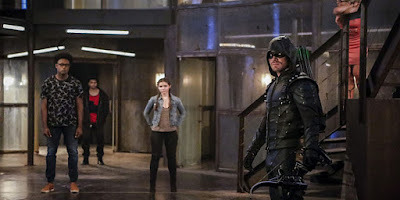 In a mildly confusing turn, our Ragman was introduced in the same episode we learned the name of our new villain Prometheus, a new dark archer. Felicity's new beau is a police officer who doesn't know about her other life as a vigilante. And yes, she is just as much a vigilante as the rest of them even though she doesn't go out and bust heads. Tobias Church had a couple of nice scenes, but he wasn't the focus of the episode. I hope he doesn't go the way of other early season villains, but I have a feeling he might. Curtis: "I'm sure that kicking things off by lying to everyone is an awesome idea." Evelyn: "I thought there was going to be orientation." Oliver: "Did the brochure say that?" Thea: "What's the backup plan?" Oliver: "Me. It's one of the advantages of having the mayor moonlighting as a vigilante." Thea: "Or the vigilante moonlighting as the mayor." Felicity: "Some could say the same about you. (pause) I've been waiting five years to make that joke." Evelyn: "The Green Arrow is the mayor?" Curtis: "I had the same cognitive dissonance." Both the central story and the flashbacks in this episode continue to be very strong. Plots seem to be flowing together, and for the most part the show feels like it is back to form. 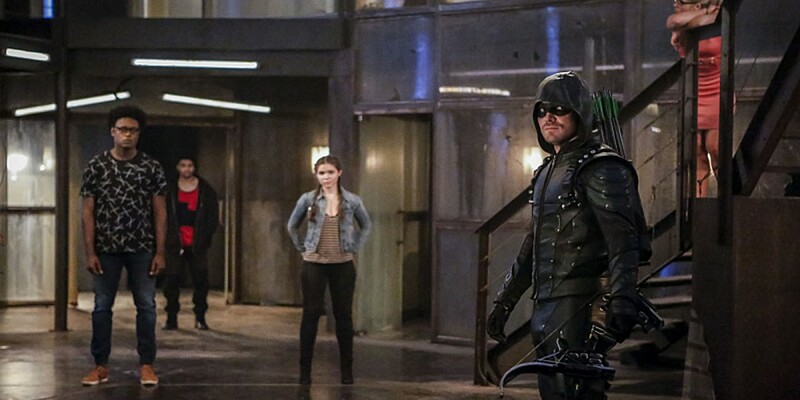 3 1/2 out of 4 new vigilantes recruited into Team Arrow.